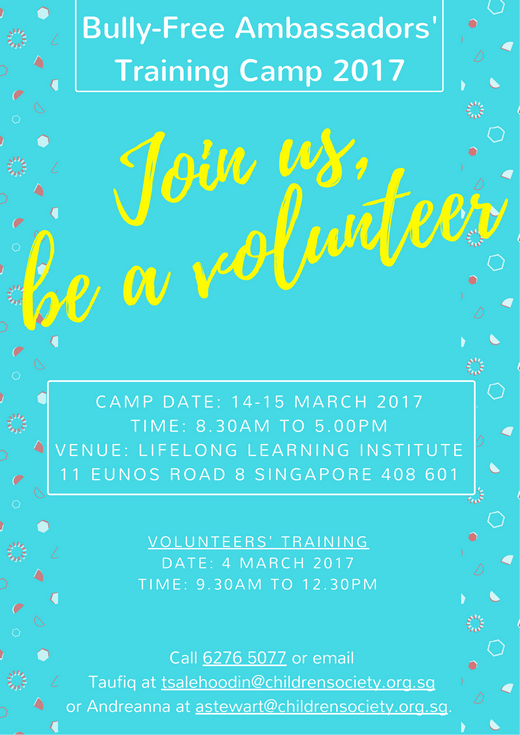 Singapore Children’s Society is currently looking for passionate volunteers (Yes! You!) to facilitate Bully-Free Ambassadors’ Training Camp in March 2017. The aim of the camp is to train selected Primary 3 to 5 students from various schools to become effective Bully-Free ambassadors in their respective schools. These Bully-Free ambassadors will then campaign and spread the awareness among their peers in their respective schools. This year is the 10th run of Bully-Free Camp and you are invited to be a facilitator for the camp! Your roles during the camp will include facilitating the students, managing, planning, and brainstorm ideas for the campaigns, and also taking care of the well beings of the students.